What happens to my valuables on a shipwreck? Note: The “Problem Solved” column normally deals with non-travel issues that are fixable, but a recent reader question prompted me to make an exception. Fran Perry is curious about what happened to the valuables belonging to the Costa Concordia’s victims. I dredge up an answer. Posted in Problem Solved Tagged CONCORDIA, COSTA, SAFE46 Comments on What happens to my valuables on a shipwreck? The Costa Concordia / Photo courtesy EU. As Carnival Corp. announced plans to salvage the Costa Concordia last week, the world’s attention focused again on cruise safety — or rather, lack of it. 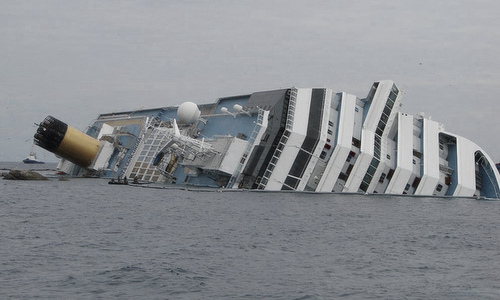 The Concordia struck a reef off the coast of Italy in January and partially sank, claiming the lives of 32 passengers. Carnival will refloat the hull in a $300 million salvage operation said to be the largest in history.